OAKLAND — As the assault trial of four men who were once members of the defunct Your Black Muslim Bakery began Thursday, some key questions emerged as a prosecutor and defense lawyers gave opening statements. First, is Dahood Bey – the man accused of planning and leading the attack and also charged with torture — really the captain of a paramilitary organization and a thuggish enforcer? Or, is he a just a minister and landlord who rented a room to the wrong person? Also, can the case’s key witness — the victim, who has a criminal record, including assault of a Pittsburg police officer — be believed? Bay Area News Group has agreed to withhold the name of the 42-year-old victim at the request of the Alameda County deputy district attorney Patrick Moriarty, who says the victim believes his life is in danger over his testimony. Bey and three other men are charged with savagely beating the man Dec. 31, 2008, at an East Oakland house Bey said he owns. Also charged in the case are Basheer Muhammad, 57, whom Moriarty described as Bey’s lieutenant, and Aujwon Muhammad and Jibrial Muhammad, who Moriarty said were soldiers in Bey’s organization. Jonathan Moore is also charged. Arguments began before Superior Court Judge Jeffrey Horner on Thursday after a month of motions and jury selection. Moriarty described Bey, 37, as the captain, or leader, of a Black Muslim sect who enforced his rules with violence. The victim, who rented a room from Bey, sometimes attended his mosque but was a member of a different sect, the Nation of Islam. Bey planned and ordered the attack, carried out by as many as 12 of Bey’s followers, because the victim didn’t obey the “very repressive and undemocratic” rules of the house, Moriarty told a jury of six women and six men. Defense lawyers said the victim started the fight and promised jurors they would find him lacking credibility. Moriarty said testimony will show that Bey and his followers didn’t like the fact that the victim was a Nation of Islam member. “Religion definitely plays a part” in the assault, he said. At a preliminary hearing earlier this year, the victim testified that among the reasons his attackers told him he was being beaten was because he had disrespected the memory of the bakery’s founder, Yusuf Bey. He said a gang of Dahood Bey’s followers kicked and punched him for about 30 minutes and threatened to tear out his teeth and tongue with pliers. Bey’s lawyer, Michael Cardoza, said his client is a minister and landlord who was attempting to settle a dispute between the victim and other tenants when the victim hit Bey first. Cardoza repeatedly told the jury in his opening statement Thursday that the victim has no credibility. During testimony Thursday, an emergency room doctor said one of the victim’s eyes was swollen shut, and he suffered broken ribs and a punctured lung. Dahood Bey is a spiritually adopted son of bakery founder Yusuf Bey, who died in 2003. Basheer Muhammad was a long time follower of Yusuf Bey. 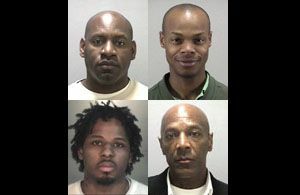 The bakery is now defunct and its last leader, Yusuf Bey IV, is charged with various felonies, including three counts of murder for allegedly ordering the killing of Oakland journalist Chauncey Bailey and three other men in the summer of 2007. Reach Thomas Peele at tpeele@bayareanewsgroup.com. Staff writer Paul Rosynsky contributed to this report. yea he knockout a police officer i was THERE SO I KNOW WHAT HAPPEN AND ILL SAY THIS IF HE HADNT KNOCKOUT OUT THAT POLICE OFFICER THEN THERE WOULD HAVE BEEN AN INOCENT MAN KILLED BY THE HANDS OF THE POLICE OFFICERS INVOLVED!!!!! he saved his friend life that night. Tell me this how many people can knock an officers out cold and only get a few months of jail time hummmmmm!!! and the officer in question was later FIRED for his bias treatment of minoritys!!! I also know what happen with this particular situation and they know what they did there a discrace to an otherwise beatiful religion and i hope they get LIFE!!! Not just for what they did but what they continue to do and thats portray islam as some type of cult!!!! !